Edelweiss Air’s seasonal San Diego to Zurich non-stop flight follows Archimedes’ rule: The shortest distance between two points is a straight line. The plane was comfortable and the crew friendly and attentive. There were free movies galore, plus plenty of good food and a wide assortment of beverages. The Zurich airport is well marked and passport control was efficient. After a long travel day, passing through several time zones, it’s important to keep moving until bedtime in a new location. We immediately hopped on a train (the station is connected to the airport) for a quick trip to our first stop, Schaffhausen. It is near the German border and home to Europe’s largest waterfall. We checked into the arcona Living Hotel, centrally located across from the depot, and finished the evening with a delightful dinner at Restaurant Guterhof. The following day we were off to explore, led by local guide Patricia Seif. 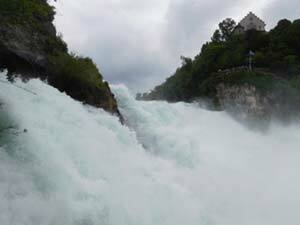 The visit to Rhine Falls was our first glimpse of the spectacular landscape that is the allure of Switzerland. On the way back, Patricia ran into a friend who was testing an 11-person, driverless mini bus. We were treated to a trial run. A short train ride to St. Gallen was next. Although we got off at the wrong station, it led to the first of two delightful interactions, leaving us with a wonderful impression of Swiss hospitality and friendliness. After asking for directions from a group of retirees at a local bar, one of the men insisted on driving us. He pointed to his tiny car, we loaded our luggage, got in and drove off. 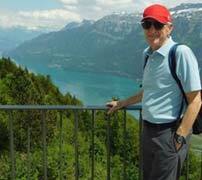 In the morning, we took a quick train ride to St.Gallen Haggen for a scenic uphill hike to Three Ponds. At the top, we popped into Dreillinden for lunch. Returning to town, we visited the historic Textile Museum. The hip, sleek LOKAL (previously a train round-house) was recommended for dinner and did not disappoint — great vibe, attentive wait staff and an eclectic menu. It was time to move on and the Voralpen Express zipped us to Lucerne (Luzern) in two and half hours. The train was fairly empty and the conductor regaled us with stories of travelers he had encountered. We also met a young American woman taking a gap semester from college. She ended up hanging out with us once we got to Luzern. Just a few minutes walk from the station, our home for the next couple of days was the Hotel Waldstatterhof. Rebecca Gisler was our guide, and without her we would have missed a lot of the wonderful history of this fantastic city. Coincidently, it was the 150th anniversary of Queen Victoria’s first visit to Luzern. The Monarch stayed for six weeks and set off a tourist boom that continues today. Here are a few of the landmarks: the Chapel Bridge, Lion Monument, Old Town and the Rosengart Collection. Take the Golden Round Trip Cruise on Lake Lucerne to Alpnachstad. Once there, don’t miss riding the scenic cogwheel to the hiking trails at Pilatus Kulm — return via gondola. It’s an unforgettable outing. Next Month: The adventure continues, featuring Interlaken, Geneva, Lausanne and Montreux. Logon to www.FlyEdelweiss.com for their complete schedule and cities served. The Grand Train Tour of Switzerland’s website is the place to go for information on riding the rails traversing the country. There are more than eight different routes, covering the four distinct regions of Switzerland: Swiss, German, French and Italian. The Swiss Travel Pass is available to purchase in increments of 3, 4, 8 or 15 days. This all-in-one ticket can also be used for public transportation, boats, cable cars, entrance to almost 500 museums and various other discounts. 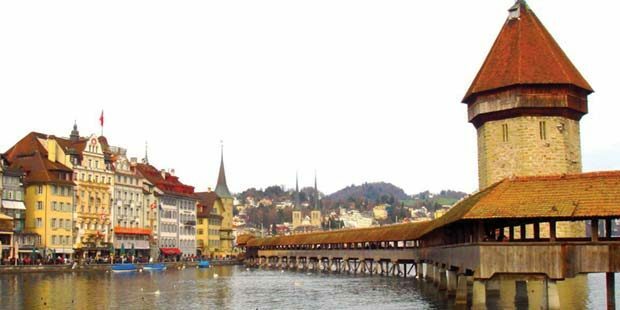 For details, logon to www.MySwitzerland.com. Also, download the app SBB Mobile at www.SBB.ch. The app offers simple and personalized timetable enquiries, plus you can purchase tickets. It was a valuable planning tool throughout the trip. Note: Many Swiss cities have more than one train station. Be careful. The arcona Living Schaffhausen, located in a quiet area, is fairly new (2014) with a modern, stylish persona, www.Schaffhausen.Arcona.ch. Hotel Einstein Congress Spa, www.Einstein.ch, is next to the UNESCO World Heritage Site Abbey District in St.Gallen. In St.Gallen, try the Chicago and gangster themed, quirkily named, Al Capone Steakhouse: Not what one would expect in Switzerland, but it was a great meal. Hotel Waldstatterhof, www.Hotel-Waldstaetterhof.ch, provided a perfect location for our stay. Built in 1898, its classic facade belies the modern interior and stylish rooms. Local guides provide an insider’s view, historical background, and lead you to spots off the beaten path. My recommendation for St. Gallen/Schaffhausen is patricia.Seif@schaffhauserland.ch; for Luzern, Rebecca Gisler at Jr.Gisler@bluewin.ch. For a quick snack, carry-out lunch or dinner, plus wine and beer, COOP’s chain of stores throughout Switzerland was our go-to spot for supplies. It’s Switzerland’s answer to Trader Joe’s. Larger train stations also offer many food options and shopping venues. Sample one of the many types of pretzels for sale at kiosks and shops throughout Switzerland. Keep in mind, hotel stays include sumptuous, all-you-can-eat buffet breakfasts. Follow Howard Hian online at www.Travels-with-Hian.com and PokerResorts.net.